Should You Take Coenzyme Q10? Lately I’ve been talking to a number of people about using Coenzyme Q10 with statin drugs for lowering cholesterol. Should YOU take Coenzyme Q10? I went to the research to find out. Statin medications (like Zocor, Lipitor and Crestor) decrease concentrations of Coenzyme Q10 (also called CoQ10). They do this by blocking the enzyme that both makes cholesterol in the liver AND makes CoQ10. So while statins decrease cholesterol, they also deplete the body of CoQ10. What is Coenzyme Q10? It is an enzyme cofactor, which means it is required for enzymes to work properly. It is particularly important for energy metabolism in the cell. It is fair to say that without CoQ10 the cell’s energy-producing mechanisms do not work at top efficiency. CoQ10 also is a potent antioxidant found in every cell in the body. If CoQ10 levels are depleted, the cells may lose some of their ability to repair damage from oxidation. After a trip to the National Institutes of Health’s PubMed research database, here are some examples of the good stuff that CoQ10 does. When you talk about Coenzyme Q10, the use people mostly think of is preventing muscle pain in patients taking statin drugs. These medications (like Crestor, Lipitor, Zocor, Mevacor and Lescol) are powerful cholesterol-lowering drugs. Unfortunately taking them also lowers the concentration of CoQ10 inside cells in the body. The loss of CoQ10 is thought to cause muscle pain, fatigue and memory problems, among other symptoms. Several studies (the one above is just an example) showed improvement in symptoms when patients taking statins also take CoQ10. For instance, the above study showed that patients have less muscle pain, muscle weakness, muscle cramps and fatigue than those taking a placebo. A very interesting study showed that when multiple sclerosis patients took enormous doses (500 mg daily) of CoQ10, inflammatory markers in their bloodstreams went down. Specifically the ones that went down were tumor necrosis factor alpha (TNF-α), interleukin 6 (IL-6) and matrix metalloproteinase 9 (MMP-9). These three compounds are inflammatory substances in the body. TNF-α induces fever and causes cells to die, and is involved in the weight loss that cancer patients experience (called cancer cachexia). IL-6 is active in the circulatory system and also stimulates activity of cells that break down bone (called osteoclasts). MMP-9 breaks down collagen in tissues and is thought to contribute to the growth of aortic aneurysms. The ability to decrease concentrations of inflammatory markers is a very interesting ability of CoQ10 that is just beginning to be explored. A very exciting study published last year showed that giving diabetics 200 mg of CoQ10 per day improved their blood sugar control and also improved their cholesterol. Hemoglobin A1C improved from 8.61 to 8.0 (not an enormous difference but every little bit helps). Total cholesterol and LDL cholesterol went down, but triglycerides and HDL cholesterol did not change. This is a mixed result, as ideally we would like triglycerides to go down too. However, we definitely don’t want HDL (good cholesterol) to go down. One of the most powerful drugs used to treat cancer is doxorubicin. It is used to treat both adult and pediatric cancers such as leukemia and various solid tumors. One of the scariest side effects of any chemotherapy drug is the potential for damage to heart muscle. Doxorubicin can cause heart failure, arrhythmias and myocarditis (inflammation of the heart muscle). Patients have survived their cancer only to die of heart failure from their chemotherapy. As far back as the 1970s, researchers were discovering that Coenzyme Q10 helped protect the heart against damage by doxorubicin. Heart muscle cells have a unique enzyme in their mitochondria that makes doxorubicin much more toxic and damaging. This is why doxorubicin is so harmful to the heart. CoQ10 seems to prevent this damage, protecting the heart from the effects of the chemotherapy. So should you take Coenzyme Q10? There are a few situations in which you might consider it. Are you diabetic? Do you have concerns about inflammation in your body? Do you suffer from fatigue, muscle or joint pain, or memory problems? Do you take statin drugs? If you are going to take CoQ10 please do your research and choose a reputable product. Make sure the company whose product you take is committed to quality testing and offers a money-back guarantee. Click here to see which product I recommend (although I bet you can guess). It’s the only one I trust with my patients, my family and my own health. Home Based Business: Do You Need A Plan B? Why would someone consider a home based business? Unfortunately I see many people in my office who SHOULD have started a home-based business several years ago. The number of unemployed and underemployed people out there is just staggering. Folks in their fifties whose companies have folded are now finding it hard to compete in the job market. Their skills need updating and they’re competing with younger people just coming out of college. Let’s face it, older people are more expensive to employ. More and more employers are downsizing, outsourcing and automating. The days of job security are long past. What will you do if your company closes? If your position is eliminated? If your company hires a supervisor who dislikes you? If you work for yourself, you have the best employer ever, LOL! No one can take away your home based business. I have had the experience of encountering an unexpected family illness. It can play havoc with your work life! Many parents would like to work less hours in order to be available for their kids’ activities. A home based business has the advantage of a flexible schedule. No one can be completely sure that they will be able to work at their job until they are financially ready to retire. Accidents and illness happen. Having a home-based business is a way to have a second source of income in case your main source is lost. A home based business is something you can cram in the corners of your everyday life. It requires some discipline but you can grow a very healthy business in just a few hours a week. I work full-time-and-then-some at my medical practice, but still find time to make phone calls to my customers while I’m in the car. I write for my blog in the evening after the kids are in bed, and on Saturday and Sunday mornings. The best time to start a home based business was 5 years ago. The second best time is right now. Watch for future posts on topics like choosing a company, finding customers, keeping happy customers, building relationships, and others. I am so mad today! Why is it so hard to get through to some organizations that pain management in nursing homes is no different from managing pain in any other setting?! This afternoon I accepted admission of two patients transferring from a large local hospital system. Both patients have painful conditions (one had an orthopedic surgery) and neither patient was provided with prescriptions for pain medication on discharge from the hospital. I have had problems with this hospital system since the DEA started enforcing more stringent regulations about the use of narcotic pain medication in the nursing home setting. Several years ago, the DEA began cracking down on perceived risk of narcotic abuse and diversion in the nursing home setting. It has become much more difficult to manage pain in the nursing home setting due to these new regulations. Difficult (meaning more hoops to jump through) but of course still very necessary. August Health Services, one of the medical groups I work with, is the largest physician-owned nursing home practice in northern Ohio. We take care of about 400 nursing home patients in 9 different facilities. We take our responsibilities to our patients very seriously. Because of our responsibility to advocate for our patients, we have worked hard to coordinate with and educate the case management departments of the hospitals in the area about pain management issues in the nursing home. When a patient is discharged from the hospital to the nursing home and is in pain, it can take hours to get medication from the facility’s pharmacy if there is no prescription. If a patient comes in with a paper prescription for their pain medication, it can be faxed to the pharmacy right away and the delay is minimized. So imagine for a minute that YOU are Mrs. Smith. You have a knee replacement at a prestigious local hospital advertising “World Class Care.” Your postoperative care goes smoothly but (because you’re older, frail, and don’t have family that can stay with you all the time) you need to go for rehab at a skilled nursing facility. You are transported in a bumpy ambulance and are uncomfortable when you reach the facility. Your nurse is very kind and attentive but there are three ambulances that rolled in before you with admissions as well. The doctor that will assume your care at the facility is juggling admissions at the hospital and takes some time answering the page from your nurse. Then your doctor must call the pharmacy to okay an emergency prescription, and the pharmacy must call the nurse with an okay to get your pain medicine from the emergency supply kept at the nursing home. You can imagine that you’re in pain now. Pain that is unnecessary but may be severe. My group has worked very hard to educate the case management departments at our local hospitals about this matter. University Hospitals Parma Medical Center has gone all-out to make sure patients have paper prescriptions when they go to the nursing home. Southwest General Hospital has been very responsive as well. I have personally spoken with individuals in the case management departments at our problematic large local health system. They consistently tell me that their legal departments have advised that it is against DEA regulations to send paper prescriptions to a nursing home. I believe this is clearly open to interpretation (since our partner hospitals and the OTHER large local health system have no problem with it). What can you do to protect yourself and your loved ones? If someone is hospitalized and then has to go to a nursing home for rehab, especially after an orthopedic procedure, make sure to speak to the doctor about pain management after discharge. Specifically ask if they will send paper prescriptions with the patient to the nursing home. If they say no, or that they’re not sure, you should consider seeing another doctor or having your procedure at a different hospital. You’re heading into the busiest part of your day, and you feel it starting. That pounding, aching, nagging and sometimes icepick-sharp pain that signals a killer headache. What does it mean? What is the cause? Well unfortunately headaches don’t just have one cause. Over 90% of adults get a headache at least occasionally, and for many of us headaches are a frequent problem. If you get headaches frequently, if you have a fever, or if headaches are severe or interfere with your life in a significant way you should definitely see your doctor. If your headaches are just occasional and fairly mild, here are 4 things you can do to help get them better. Headaches are often triggered by stress. If you are getting headaches suddenly, take a look at whether you’ve been burning the candle at both ends. Working overtime, studying hard, and skipping sleep can trigger headaches in susceptible people. Check here for more information about stress and how to manage it. Sometimes headaches can be triggered by low blood sugar. If you feel hungry and shaky with your headache, that is probably the cause. DON’T eat sweets though! Eat some complex carbohydrates, protein and fat (like half a peanut butter sandwich and a small glass of milk, or cheese and crackers). Try to avoid going more than a few hours without a healthy snack. A cold, wet washcloth on the forehead can help a headache, especially if it’s a frontal headache (located behind the forehead). Experts aren’t really sure why cold helps, but it does. Why ask why? If it works, and it’s safe, use it! Hot, steamy showers are relaxing and help open the sinus passages. If your headache is accompanied by a stuffy nose or cold/allergy symptoms this is likely to be helpful. For those who have their headache in the back of the head, a heating pad or rice sock on the neck and back of the head can soothe and relax tight muscles, relieving pain. Here’s a good link about how to make a rice sock. Tension headaches are described as a band of pain around the head. They are often triggered by stress and are related to tight muscles in the neck and upper back. Having these tight muscles massaged can help relieve and prevent tensions headaches. If these simple measures don’t help, it’s time to see the doctor. Serious causes of headache are very uncommon, but they do happen. Better safe than sorry! If you know me, you know my position on patients who use a few tablets of leftover antibiotics for their cold symptoms before they come to the doctor. They make me want to scream! Here are 4 reasons why you should NEVER use leftover antibiotics! 2. What good do you think two days of amoxicillin is going to do for you? Is it going to cure your cold symptoms? Nope. IF you need antibiotics you need a full course. 3. You just screwed up my exam findings. If I had examined you before you started taking the antibiotics, I might have found evidence of a bacterial infection. Now, however, I have NO way of telling the difference between a viral infection and a partially treated bacterial infection. Thanks a lot. You KNOW I don’t have a crystal ball! 4. Antibiotics have risks. I know many people think that antibiotics are a cure-all for everything but they aren’t all that safe. Allergic reactions do happen unexpectedly (my husband is a great example but that’s a story for another day). There is a life-threatening form of diarrhea that happens after antibiotic use called C. difficile. This can become chronic and is happening more and more. Any lady who has developed a yeast infection after taking antibiotics can vouch for the risk. So what can you do? There are definitely a few things you can do to avoid antibiotics. 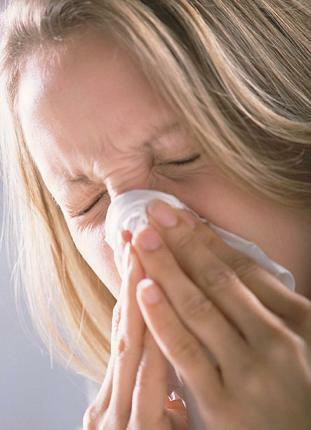 First of all, take a look at whether you’ve really given yourself time to kick the cold symptoms on your own. Mayo Clinic, above, says antibiotics should only be used for “severe sinus infections lasting longer than 2 weeks.” Most people who come in to see me for what they believe is a sinus infection have only had symptoms for 2-3 days. When you feel yourself getting sick with a cold, take good care of yourself! Get extra rest, eat healthy and drink plenty of (non-caffeinated) fluids. Consider taking vitamin C or a good echinacea supplement. Lastly please trust your doctor. If your doctor examines you and listens to your symptoms and doesn’t find a reason to prescribe an antibiotic, please accept that RIGHT NOW there’s no reason to take one. If your symptoms don’t get better as expected, though, get in touch with your doctor and bring him or her up to date. We don’t have a crystal ball, and can’t tell that the cold you had when we saw you a week ago wasn’t going to turn into a terrible ear infection in the future. QUESTION: How many times in the last year have you taken antibiotics? This week I’m tackling the popular microwave nutrition loss myth. 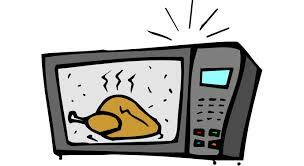 This theory holds that if you cook your food in the microwave the nutrients in the food are destroyed. Proponents state that people should cook food in the oven or on the stovetop to retain as much nutrition as possible. I did a search on the National Institutes of Health PubMed website, which catalogs all peer-reviewed published research. I was unable to find a single article that showed degradation of nutrients during cooking in the microwave. However, I did find articles that showed nutrients were preserved during microwave heating. Turns out that any way you cook food, you lose some nutrition in your food. There are three factors that affect the deterioration of nutrients: heat, water and time. Heat destroys the nutrients, and the longer the food is exposed to the heat, the more they are destroyed. Water also leaches the vitamins, minerals and other nutrients out of the food. Microwave cooking is FAST. This is why we use it so often! It also requires very little added water. Combining a small amount of water with quick heating means nutrients are actually preserved nicely while heating in the microwave. Compare microwave heating with baking, broiling, boiling or frying and you can see that if your goal is eating food that has as much nutrition as possible, microwaving isn’t a bad choice. I generally only use my microwave to reheat leftovers. If you were going to actually cook food in the microwave, it’s best to use a microwave-safe dish that closes tightly. Put a small amount of water in the dish with the food, and microwave a short amount of time. Essentially you are steaming the food. Quick note: Be VERY careful what sorts of plastics you use in the microwave. Some plastics can leach harmful chemicals into food when the food is heated or reheated in them. It is better to use glass or microwave-safe ceramic dishes in the microwave. QUESTION: What is your favorite food to prepare in the microwave?